If there is an answer, it lies with the proles. Once again the other day, I heard someone use the phrase ‘It’s like 1984!’ to complain about speed and security cameras. 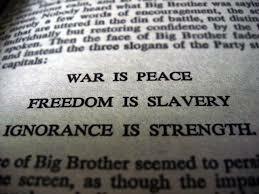 ‘You haven’t read 1984, have you?’ I asked, and sure enough I was right. In Orwell’s novel, the populace are indeed watched by cameras very nearly all the time, but this is not the main point. The cameras are a very small and crude part of the Party’s ability to control the behaviour of others. Controlling the behaviour of others through fear of punishment is achieved through surveillance to a degree, but the Party’s goal is to control ultimately what people think in order that the very concept of disobedience becomes impossible to articulate. An endless, grinding, brushfire war between shifting alliances consumes people and materials, with no obvious gains ever made. The nebulous ‘enemy’ have the capacity to strike rarely, randomly and with indifferent success at the civil population, but the fear of same resigns the populace to the necessity of tight ‘security’ thanks to the human brain’s inability to accurately assess risk while in a state of fear. A media and entertainment industry colludes whole heartedly with the government in attempts to mould the thoughts of the people. Endless, unavoidable news stories trumpet the awesomeness of ‘Us’ and especially the horrid, hatefulness of ‘Them’, whether they be the aggressive enemy abroad or the insidious enemy at home. Fear is promulgated and then forged into hate and zeal and certainty; into faith. The dumbly obedient are lauded and the thoughtful and inquisitive are marginalised. Knowing more than you absolutely need to know is seen as suspicious in some way. History is routinely redacted to suit the narrative The Party wishes to be believed: It’s always been this way. The Party has always been here. The Party is making life better for you, everyday. Language is subjected to an effort to drastically reduce vocabulary and shades of meaning. If one does not have the vocabulary to describe refusal to obey, translating the thought to action becomes difficult. To this end, education among the proles is rudimentary at best and among Party members it focuses on indoctrination. No one needs to learn to think, only to obey. The ‘Newspeak’ dictionary shrinks with each edition, excising superlatives, surplus adjectives, archaic and ‘offensive’ terms; offensive, in this case referring to words that offend The Party’s morals only. It becomes impossible to say or even think anything not completely loyal. So don’t worry about the cameras. Cameras are at best a crude, inelegant method of coercing and controlling a population, capable only really of controlling behaviour within an area under their purview. The modern west isn’t really like 1984 just because we have lots of cameras. Maybe there’s a camera here and there, but in our own homes, and in our own heads, we are free people. None of all that other stuff is happening. Absolutely not. No. Unite Against Hate on the Hoe…22/06/2013.